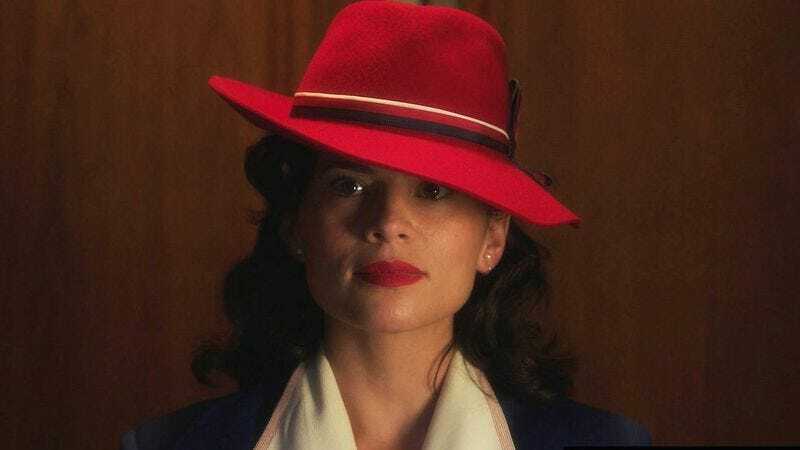 Confirming what fans of the show already knew on some level, even if they didn’t want to believe it, The Hollywood Reporter brings word that ABC has officially canceled the low-rated but critically beloved Agent Carter. Rumors of the show’s imminent demise have been swirling for a while, especially after star Hayley Atwell booked another gig, the legal drama Conviction, with ABC back in February. (Conviction, probably not coincidentally, was ordered to series this afternoon.) But this means that the season two cliffhanger finale will now forever be left unresolved, unless of course some streaming service or another with a pre-existing business relationship with Marvel decides to pick up the show. (Looking at you, Netflix.) Until then, goodbye and thanks for all the hats, Peggy.